It's like having four charger-analyzers for AA and AAA NiMH / NiCD batteries.??? Digitally displays capacity, voltage, time and current. - Endless programming possibilities - over 10,000 ways ! 29 selectable charging and discharging rate. Charging current from 0.2A to 2.0A and discharging current from 0.1A to 1.0A in 0.1A increments. Charge: Recharges the battery at the selected rate. Suitable for batteries used frequently. Refresh & Analyze: Charges the battery, rest for one hour, discharge, rest again, then recharges it. Selectable charging and discharging rate. Suitable for batteries stored for more than two weeks but less than 3 month or those showing poor performance. Break-In: Also known as IEC capacity measurement and "Battery Forming". Charges battery at 0.1C for 16 hours, rest for one hour, discharges battery at 0.2C, then recharges again at 0.1C for 16 hours. 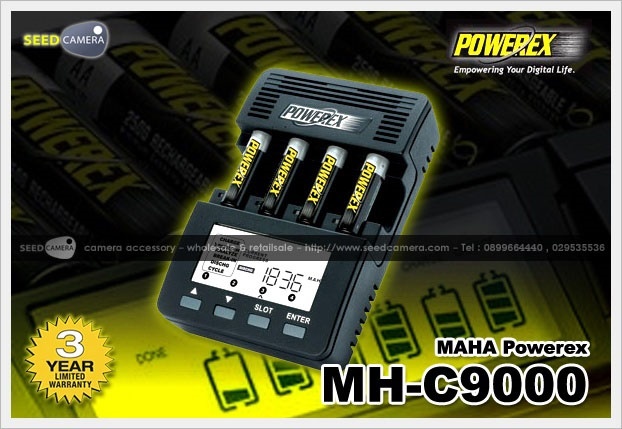 Suitable for new batteries and those stored for more than 3 month. - New ways to take care of your batteries and maximize runtime! In most devices, usually two or more batteries are used together. When batteries are used in a series, the performance is limited by the worst one. In other words, one poorly performing battery can significantly reduce the device runtime. Battery matching refers to grouping batteries with similar ?actual? capacity. To perform this, use the Refresh & Analyze mode to determine the battery capacity. Group batteries with capacity within about +/- 5% of the rated capacity. New batteries and those stored for extended period become chemically deactivated. Battery forming is a charge-discharge-charge cycle which forces a full charge into the battery at a very slow rate. This process activates the battery. In certain cases, it needs to be repeated two or three times. Battery forming can be performed using the Break-In mode. Independent negative delta V, temperature and timer protection eliminates over and undercharging. Worldwide 100-240V switching adapter - light weight and small. Also compatible with 12V input. Will work on car when used with the optional cigarette lighter adapter. Supported Capacity : 100 to 20,000mAh.